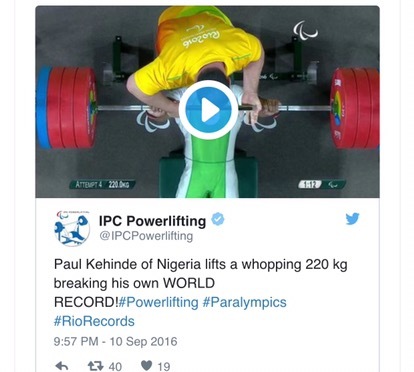 It was certainly a Saturday to cherish for Team Nigeria as Paul Kehinde twice broke the men’s -65kg World Record (WR) to win GOLD in the Powerlifting event at the ongoing Rio 2016 Paralympic Games. Kehinde’s win is Nigeria’s second GOLD of the Games, bringing their tally to four medals with Esther Onyema winning Silver in the women’s -55kg earlier on. With the event rescheduled from the initial 2pm (Nigerian time) on Saturday, most Nigerians missed the event, but Kehinde ensured they would have something to cheer about when they catch up with the news later on. The Nigerian Powerlifter was untouchable, opening his account at 205kg which he cleanly took with ease. China’s Peng Hu who won Silver did so with his best mark of 200kg, while Egypt’s Shaaban Ibrahim got Silver with a his best weight of 193kg. That’s how far Kehinde was to other competitors. In fact Kehinde was competing against himself, lifting 210kg and going on to lift a WR of 218kg. Roared on by the spectators, the Nigerian was buoyed as he smashed that WR lifting 220kg in the process. Following Kehinde’s feat, Nigeria has now amassed four medals in two days and will look to add more in subsequent Powerlifting event they would compete in. This is so remarkable!!!! Amazing athlete! Go team Nigeria, go!!! !